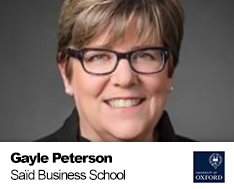 As co-founder of an international philanthropic consultancy, Gayle has extensive experience in market-based change to support innovations in business and social sector strategies to achieve international social change. She has managed and assessed more than $12 billion of grantmaking resources on behalf of the world’s largest foundations. Her programme expertise includes poverty alleviation (with special emphasis on women and children, particularly girls), strategic learning and evaluation, multi-sector partnerships, food systems reform, and triple bottom line strategy. Gayle’s first Master’s Degree in Social Policy and the Law is from the University of Chicago. Gayle’s thesis for her MSc from HEC, Paris School of Management and Saïd Business School, University of Oxford, “Wicked Problem Construct: Business and Social Sector Strategies for Global Change,” focused on women and children at the centre as she examined how to connect the top trillion in resources with the bottom billion around the world who live in poverty in a way that is ethical and effective. Currently, she is researching, writing, and putting together an executive education curriculum about these issues to share best and next business practices with business and philanthropic executives to give them the tools they need to create scalable and sustainable change.